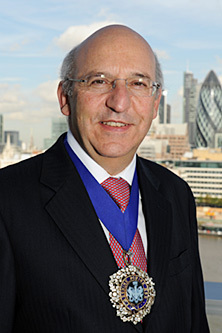 Sir Michael Bear took office as the 683rd Lord Mayor the City of London on Friday 12 November 2010. As part of this role he served as Chancellor of City University London. Professionally, Sir Michael is a civil engineer and has held senior positions in both the construction and property industries in the UK and abroad. In a career spanning several decades, Sir Michael has worked in the international construction industry, managing projects in China, the Far East and West Africa. In London, he was responsible for the successful completion of the development of Spitalfields as Chief Executive of the Spitalfields Development Group. Sir Michael has served on the Court of Common Council as Common Councilman, Deputy and Alderman of the Ward of Portsoken, as well as on many committees of the City of London Corporation. He was also the Sheriff of the City of London in 2007-2008 before being elected to the post of Lord Mayor of the City of London in 2010-2011. He is a member of the Worshipful Companies of Engineers, of Chartered Surveyors, and of Paviors. His voluntary work has included overseas projects in Africa and Bangladesh and domestic projects throughout the UK. Sir Michael is involved with the Spitalfields Market Community Trust and The Drinking Fountain Association, in addition to being a Governor of the Sir John Cass Foundation and primary school, The Thomas Coram Foundation for Children, Clifton College and Hackney City Academy. Sir Michael was born in Nairobi, Kenya and grew up in Cyprus. He was educated at Clifton College, Bristol, the University of Witwatersrand, Johannesburg and Cranfield University, UK.